Belton, Texas – On Wednesday, February 6, the University of Mary Hardin-Baylor celebrated its 174th birthday. University officials marked the milestone with a short ceremony at the grave of co-founder Robert Emmet Bledsoe Baylor and with a party in the Bawcom Student Union. 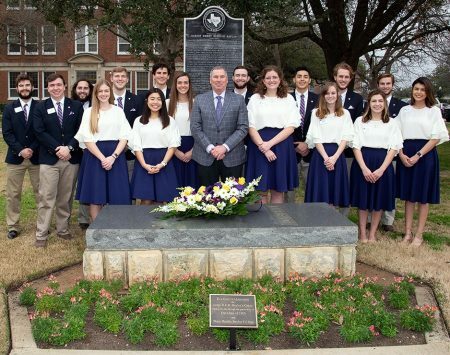 Present Randy O’Rear was joined by a group of student ambassadors at Baylor’s grave, which sits in front of W. W. Walton Chapel on the UMHB campus. O’Rear led the group in a prayer before students placed a wreath on the grave. Following the ceremony, the group moved to the Bawcom Student Union, where O’Rear cut a birthday cake and students, faculty, and staff from around the campus took part in celebrating the occasion. The University of Mary Hardin-Baylor, chartered on February 1, 1845, is one of the oldest, most reputable universities in Texas. UMHB remains committed to providing students with small classes and personal attention in both graduate and undergraduate degrees.